The effects of smoking marijuana fade quickly, however, the drug may be detected within the body for weeks and generally longer. The amount of time the active ingredients and breakdown things of weed stay within the system depend on how usually or what amount of marijuana the user has been smoking or ingesting. How accurate are Marijuana Urine Tests? The active ingredient in marijuana is tetrahydrocannabinol (THC), also known as delta-9-THC or just THC. It enters the body’s blood speedily just after smoking marijuana. If marijuana is swallowed instead of smoked, it takes longer to be absorbed into the blood, sometimes from twenty minutes to an hour and a half. The short-term effects of marijuana on memory, learning, problem-solving, and coordination last for one to two hours, with some lingering effects for up to twenty-four hours. it has been shown to impair your driving performance for up to three hours, in line with the studies quoted by the National Highway Safety Administration. THC is detectable in the blood for short amount of time, a few hours because it’s quickly broken down and changed into molecules called metabolites. at least eighty different metabolites are formed from tetrahydrocannabinol. These metabolites are resided in body fat and are step by step eliminated from the body through excretion and urine. Because marijuana stays within the blood for only a short time, blood tests for marijuana are sometimes not used. The exceptions are in the case of automobile accidents and some roadway sobriety checkpoints. Blood or saliva tests will show current intoxication. However, in contrast to blood alcohol concentration tests, they do not indicate the grade of intoxication or impairment. Urine tests for marijuana metabolites will just only show recent marijuana use, not intoxication or impairment. 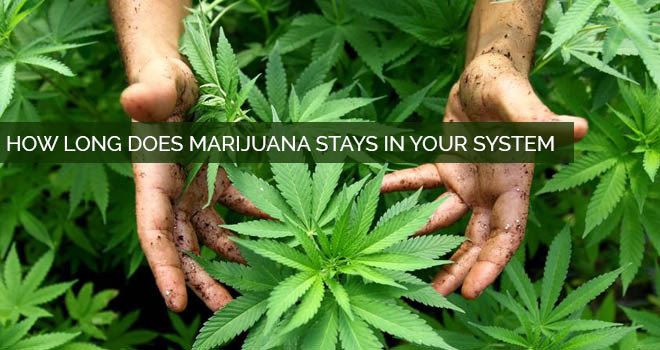 This is due to the time required between smoking and your body breaking down tetrahydrocannabinol to the metabolites that are eliminated within the urine. However, because several employers have an intolerance for drug use, most workplaces use urine tests for any recent use of drugs. There exist some THC metabolites that have an expulsion half-life of twenty hours. However, some are stored in body fat and have an elimination half-life of ten to thirteen days. It takes 5 to 6 half-lives for a substance to be nearly entirely eliminated. This can be why you see advice that one-time use is perhaps not detectable after five to eight days. Most researchers agree that urine tests for marijuana will sight the drug within the body for up to thirteen days. However, there’s anecdotal proof that the length of time that marijuana remains within the body is stricken by how often and frequent the person smokes, what amount he smokes, and how long he has been smoking. Regular smokers have reported positive drug check results when forty-five days since last use and serious smokers have reported positive tests ninety days after quitting. Although false positives are common for different substances, they’re rare for marijuana because of the delicate tests used. The laboratory first screens the sample with an immunoassay test, called the EMIT or RIA. If positive results are achieved, the sample is once more screened with a gas chromatograph mass spectrometer (GCMS) that is way more accurate. That is why false positives are rare. No noted substances would cause a marijuana urine test to come a false positive. At just once, ibuprofen (sold over-the-counter as Brufen, Motrin, and Nuprin) would cause false marijuana positives. However, today’s tests are adjusted to eliminate that drawback.